Computing the resistance between corners of a resistor cube is a traditional electronics "brain teaser." There are plenty of videos on the Net covering the theory, and I've also posted a Web log entry about how to analyse resistor networks, but in this video I actually build the cube in real life and measure it. 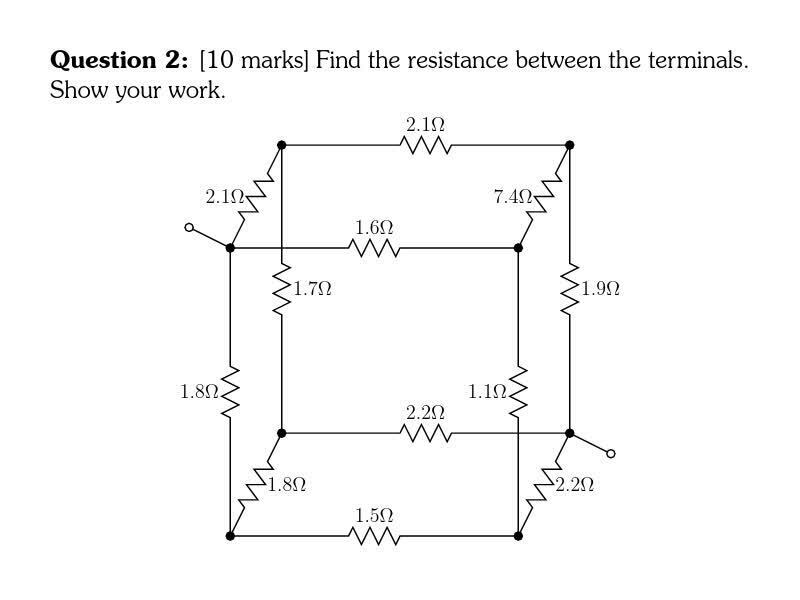 My results, for a cube with equal 100kΩ resistors along each edge, are as follows. Between diagonally opposite corners (across the centre of the cube), measured 83.65kΩ; theoretical value would be (5/6)*100kΩ = 83.33kΩ. For diagonally opposite corners on a single face, measured 75.27Ω; theoretical value (3/4)*100kΩ = 75.00kΩ. Along a single edge, measured 58.53kΩ; theoretical (7/12)*100kΩ = 58.33kΩ. Those measured numbers are a little high. When I measure other resistors from this same batch on this same meter, unassembled, they all read about 100.22kΩ. Bearing in mind that they are 0.1% resistors, the highest true value they could have while being within stated manufacturing tolerances would be 100.10kΩ. Then there's a small additional variation from temperature coefficient, and any remaining error would be due to the limited accuracy of my multimeter (which is supposed to be 0.15% plus three of the smallest digit in the display for this resistance range, but there may be a couple of additional footnotes on that). All in all, I'm actually surprised that the measured numbers are as far from the theoretical ones as they are, but the measured numbers are still basically reasonable and I'd take these results as validating that the theory does work.